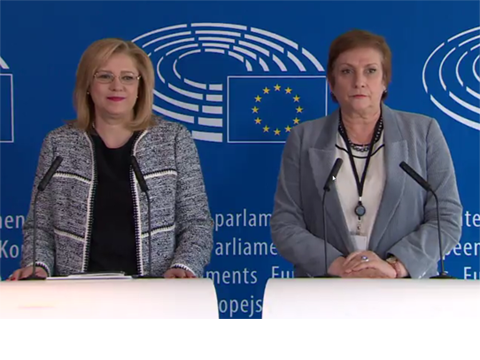 On this occasion, Corina Creţu reviewed the key decisions and substantial results delivered through cohesion policy over the last 5 years. "It is hard to believe that 5 years have passed since my first appearance in the REGI Committee as a nominated Commissioner for regional policy. Today was very emotional for me as I held this last exchange of views with REGI Committee members, under the current European Parliament. We have achieved a lot over these 5 years: from the Greek special measures to the post-2020 cohesion policy proposals, we have delivered well for the European citizens, everywhere, and I could not have wished for better partners", said Commissioner for Regional Policy Corina Creţu. “During the past five years, we have accomplished a great amount of work together, in a good spirit of cooperation. We have defended cohesion policy for all regions in Europe, promoting a new reformed cohesion policy focused on sustainable growth, green economy and social inclusiveness”. cohesion policy has brought positive results to all EU regions, no matter the country. Nevertheless, special measures were designed to provide specific support to lagging regions and regions in industrial transition, in particular the decisive EU support to the recovery of Greek regions in the aftermath of the 2008 crisis. Communication efforts have made EU citizens more aware of the benefits of cohesion policy. Besides, the removal of many cross border obstacles has made life easier for the 170 million EU citizens living in border regions. Thanks to strengthened support to local initiatives, around 1,500 territories have been benefiting from EU support for their local development strategies (worth EUR 32 billion). Under the current programming period 2014-2020, cohesion policy has been simplified, making it more user-friendly. This will continue after 2020, thanks to 80 simplification measures fostered by the Commission and the Parliament. This work also allowed achieving better-targeted investments, through strengthening the link between cohesion policy and the European Semester on Economic Policy Coordination, as the 2019 Country Reports have shown. Implementation on the ground of cohesion policy programmes should start as of 1 January 2021, to make sure EU funding gets as early as possible to EU citizens. The Parliament has worked hard towards this target, adopting their position on the Commission proposals for 2021-2027 cohesion policy in a timely manner.